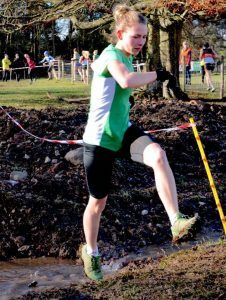 The final fixture of the North Wales and Border Cross Country League was run on the partly thawed fields in Oswestry with its customery hills and water hazards to contend with. 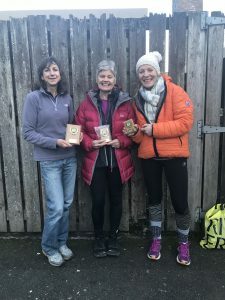 The ladies’ team was missing some if its usual counters so the honour of saving the team from dropping to division two was dependant on a team based on youth and experience. They stepped up to the mark spledidly putting in a fantastic performance and showing that they are not above their station in the middle of the first division. For the first lap Alaw Medi put in a hard effort and held on to finish 21st woman on the 5k course. Emma closed up to within 7 places of her and won her W55 category for the season. Elen Baugh and Mel Morris allowed Katy to get a 30 metre lead at the start and tried hard to get nearer all the way round. Mel fell over in the attempt and Elen just failed by a foot or two to catch Katy (approximately 40th and 41st) on the line. After Mel fell she lost contact with the Baugh sisters and finished in 51st and was third in her category for the season. Menai Baugh had a steady race picking off those in front of her to come second in the W60 category for the season. There were 11 men representing the club providing a great turnout. Shaun Hughes once again showed how indispensable he is with a well judged run into 14th place on the 9k course. He was backed up by Joe Welch in 45th and Dan Jones in 52nd, both pushing hard on the first lap and slightly paying the price on the second. Next to finish were the ever reliable Glen Price in 58th and Tony Wood in 62nd. David Baugh moved up from a slowish start and steadily picked off the opposition to finish as the 6th counter in 72nd. Owen Conry used his experience and ran the race tracking David Baugh to the finish in 74th and just losing out on the downhill finish. Huw Willaims had a strong start early on but the energy-sapping sticky mud took its toll and he dropped back to 79th just in front of Mat Jones in 81st. 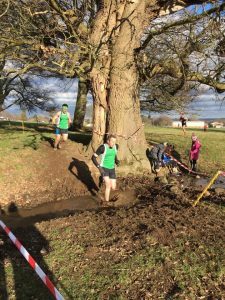 Duncan Jones enjoyed the muddy conditions to finish in his highest placing for the season in 103rd followed by Tony Benton in 106th. This made Denbigh men 5th team on the day and their best performance of the season. Individual category prize winners for the season were. This entry was posted in 5K, Cross-country, Parkrun, Weekly report. Bookmark the permalink.